NECC Swim Club is for swimmers who want to practice strokes, build confidence in the water, get a good workout, meet new friends and have fun! Swim Club is open to swimmers who have passed Level 4 and above, and swimmers may choose to swim 1-5 days each week. 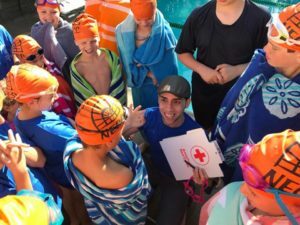 During the summer, swimmers have the opportunity to participate in meets in a positive and supportive environment. No Swim Club Memorial Day (May 27) – Monday fees will be prorated at registration. Discounts for multiple days calculated at time of payment or by calling NECC Front Desk at 503-284-3377.